The Adrenal 90 Tablets from Dee Cee Laboratories® is a source of vitamin C‚ in the form of L-ascorbic acid‚ and Pantothenic acid‚ in the form of calcium pantothenate. These tablets may help in supporting a healthy adrenal function. A strong adrenal function will help the body control blood sugar‚ burn protein and fats‚ and regulate blood pressure. 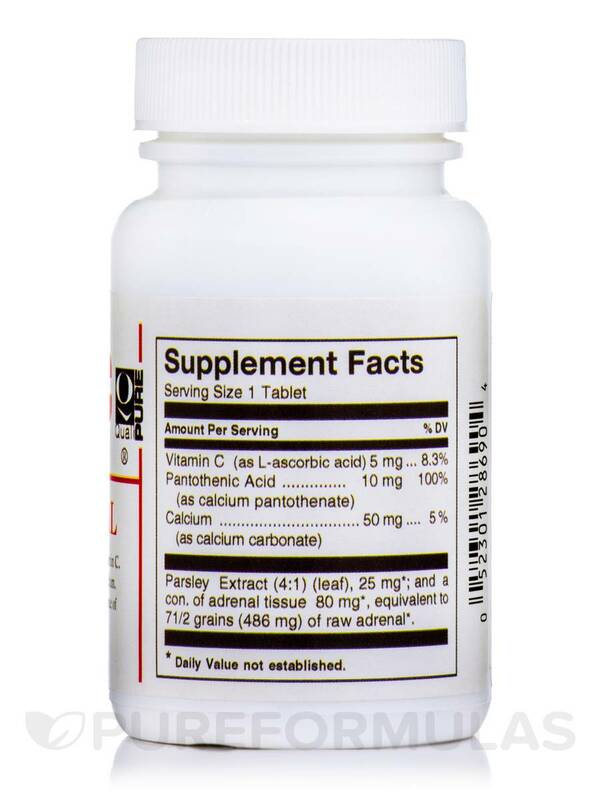 The presence of important nutrients like vitamin C and Pantothenic acid in these tablets may make it a highly useful daily supplement in your diet. 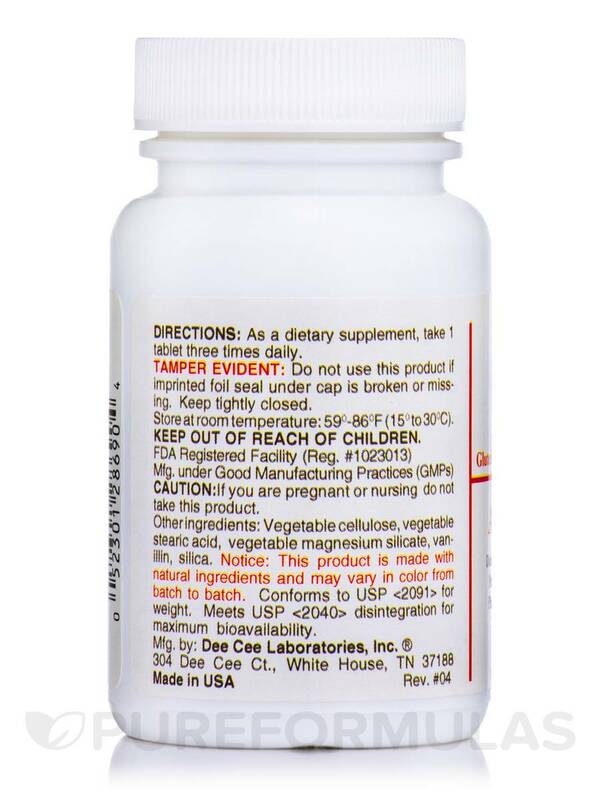 This dietary supplement from Dee Cee Laboratories® is known to help in promoting a strong adrenal function by maintaining homeostasis during stressful body conditions. They may be important for general bodily functions and maintenance. Adrenal glands are powerful endocrine glands which manufacture and secrete steroid hormones such as cortisol‚ estrogen‚ and testosterone. Researchers believe that these hormones are responsible for the body to deal with stress from every possible source‚ ranging from injury to work-related stress. The presence of Pantothenic acid in this supplement may also act as a stress reliever and alleviate the effect of adrenal glands. This dietary supplement contains a concentrate of adrenal tissue and is free from gluten. 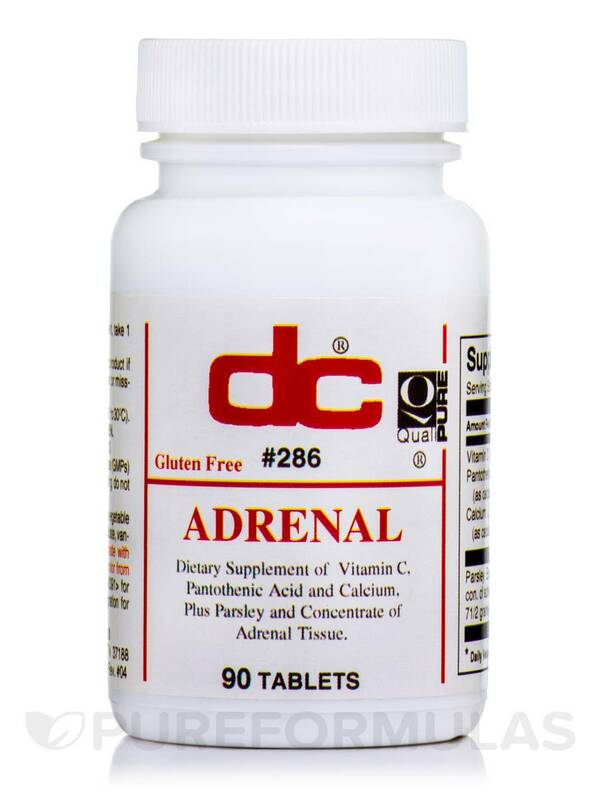 Get Adrenal 90 Tablets from Dee Cee Laboratories® and help your body promote a healthy adrenal function. Parsley Extract (4:1)(leaf) 25 mg* and a concentrate of adrenal tissue 80 mg*‚ equivalent to 71/2 grains (486 mg*) of raw adrenal. Other ingredients: Calcium carbonate‚ vegetable cellulose‚ vegetable stearic acid‚ vegetable magnesium silicate‚ vanillin‚ silica. As a dietary supplement‚ take 1 tablet three times daily.